ICE REFRIGERATION CAN SUPPLY AND INSTALL ALMOST ANY BRAND OF AIR CONDITIONING EQUIPMENT AVAILABLE WORLDWIDE. Ice refrigeration services provide high quality and affordable air conditioning services for commercial and industrial companies. We are committed to providing the highest quality air conditioning services within the industry. Every job undertaken is performed and supervised by our own engineers who we ensure have been trained to the highest standards by the leading air conditioning manufacturers. We do not use sub contractors. We do sub contract our services to other companies who use us time and time again due to the trust they have gained in our air conditioning service. We can supply Daikin, Mitsubishi, Fujitsu, Samsung, LG and Hitachi; all configurations can be supplied and installed, whether it’s split type, VRV, VRS or ducted. We will help you to decide which solution would be best suited to your particular situation. The best units come with, rotary compressors with DC inverter technology for high performance and low noise and vibration. These units operate using R410A environmentally friendly refrigerant. Tailored air conditioning services to suit your needs! Having an air conditioning system installed is a considerable investment. We always recommend that you protect this investment with a well structured air conditioning maintenance plan. To ensure that your system will last for it’s maximum life span. There are many different types of air conditioning system. Ice refrigeration services are able to provide a maintenance plan which is specifically tailored to the needs of your system. This will ensure your air conditioning is maintained to allow it to keep working to it’s optimum performance levels. Through experience we have noted that the majority of expensive repairs to air conditioning systems that we have undertaken has been because the system has not been well maintained. Ice refrigeration services are Refcom F-gas certificated. F-gas are new and safe gases used within air conditioning units. This certification allows our customers to feel comfortable our knowledge and expertise of this relatively new technology. Which will ultimately ensure safety at all times. There are two main types of air conditioning systems. Simple or packaged cooling systems and centralised (complex) cooling systems. They both provide their individual benefits. Splitpackaged units – These comprise of a single outdoor unit which connects through refrigerant pipe work to the indoor unit, which is generally mounted on the floor or ceiling. Multi-split packaged units – These comprise of a single common outdoor unit which uses a network of refrigerant pipe work to connect to multiple ceiling, floor or wall mounted indoor units. These systems are generally reversible. They will allow the operation of a heat pump and provide heating. Each indoor unit will generally contain it’s own controls allowing room temperatures to be adjusted separately and often by use of a timer. 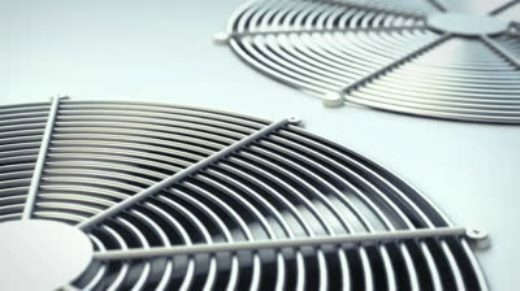 Air systems – Starting at either an air handling unit or a heat exchanger to generate cooled air. This air then goes through ductwork and is distributed to conditioned spaces through grilles or additional terminal units. The air can also be cooled via these additional terminal units. Cooled water systems – A central unit will produce cooled water and distribute it to all terminal units located in the conditioned spaces. These terminal units will either be recirculating room air, drawing air from outdoors, or drawing air from a ducted system. No matter how the unit is collecting this air the cooled water system will use the cooled water to cool this air. Reversible heat pump systems/Water loop – These systems will have a common temperature controlled water loop. In each treated space there will be an individual unit, which also contains a reversible heat pump. Heat is passed between the individual units and the water loop to provide the optimum conditioning for each conditioned space. If the water loop has an excess of heat it will dissipate this through a central cooling tower. If heat needs to be generated for the loop this is often provided by a central heat generator. Do you have a plan in place should your R22 equipment fail? Phone ICE for advice on refrigerant retrofitting and other options to keep your cooling equipment running. You don’t have to replace your equipment, just ask!